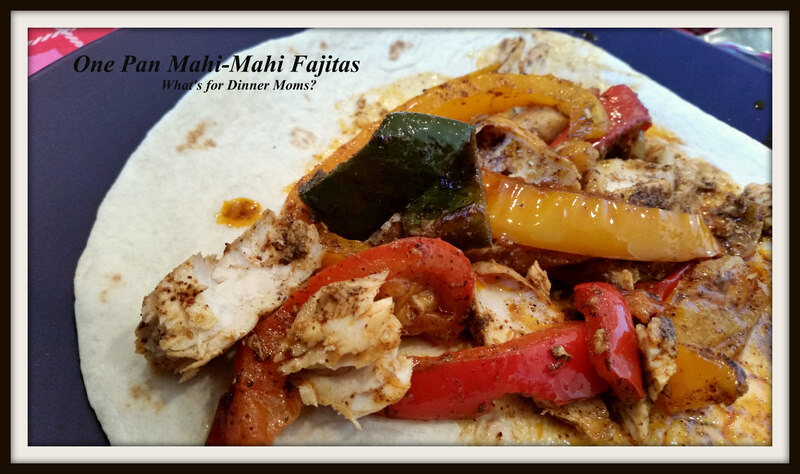 One Pan Mahi Mahi Fajitas – What's for Dinner Moms? One pan meals? Yes! I hate doing dishes and the less dishes I have to wash the happier I am. Ask my kids about using 5 utensils for making a pan of soup. Drives me nuts! This is technically one bowl and one pan, but it works. This meal is simple and the flavor was huge. I only added one rather large poblano pepper to the dish but you can add more if you like. I wasn’t sure if my family would like the flavors but they did and next time I will add more. This dish will work with chicken, beef, pork and other seafood too. We loved this meal. It was so simple and the flavor was very good. I almost felt good about what I was giving the family for dinner. Fish, peppers, onions on a tortilla with a sprinkle of cheddar cheese, sour cream, and salsa seems almost healthy. I served this with a side green salad. Leftover Hint: Make some rice and place the leftover Mahi Mahi Fajita mixture over the top. Sprinkle with cheese, sour cream and salsa for a hearty lunch. OR make a nice green salad and add everything to the top of the salad. My kids love leftover change ups! In a bowl combine olive oil, chili powder, cumin, and garlic powder. Lay peppers and onions on the baking sheet. Pour 2/3s of the sauce over the vegetables and toss to coat. Remove pan from oven. Stir the vegetables. Place the fish on top of the vegetables and cover with the remaining sauce. Return pan to oven for 20 minutes. When fish is firm to the touch and flakes easily remove pan from oven. Break fish into large chunks and serve hot with vegetables. Thank you so much! Oh, they do their fair share and we have a dishwasher. The layout of our kitchen is wrong so even a pan and spoon make the kitchen look cluttered so I feel as I do dishes all day because I hate seeing them. My quirk. Glad to hear that. We were the dishwashers and driers in my mother’s house and we didn’t have a dishwasher. And I do know what you mean about weird configurations. I had my kitchen done last year and I still couldn’t get a dishwasher unless I reconfigured it, which I didn’t do since it cost enough even without a new configuration. The sink is in the center of the kitchen! I can keep most of the island cleaned off but any stray dishes look icky. Yeah, I am known for taking the offending item and tracking them down. Lol. Sounds like a lovely, easy meal. I just love the taste of poblano peppers! I’m growing some more this year, our poor summer weather last year didn’t produce many. I hope we get a great growing season this year. What I love about fish too is it cooks up so quick, yum! Thank you! They were delicious. I am definitely getting more pablanos to use!